In Greek mythology, a nymph, from the Latin word nympha, is any member of a large class of female nature entities, either bound to a particular location or land form, such as mountains, groves, springs, rivers, valleys, and cool grottos, or joining the retinue of a god, such as Dionysus, Hermes, or Pan, or a goddess, generally Artemis. Nymphs were the frequent target of lusty satyrs, their male counterpart. Worshiped by the ancient Greeks and said to come from the earth, they were seen to be care givers of the land and life in general. Although not immortal, they lived extremely long lives. Unlike many other mythical creatures such as fairies and pixies, nymphs are rarely mentioned in contemporary popular culture. Nymphs are most generally pictured as young, vital, beautiful young women embodying the age of fertility and were strongly attractive to young males. They represented the ideal woman, beautiful, the source of new life and able to nurture it. Yet, their relationships with men were generally troubled. While some men were overcome by their beauty, becoming infatuated and unable to live a normal life, others abandoned the nymph who loved them, leading her to seek jealous revenge. The nymph, therefore, while possessing the physical characteristics that attract a man and produce new life, nonetheless lacks the internal qualities that are essential to true human love. The exact origin for the word nymph is obscure. The Oxford English Dictionary claims that the word nymph comes from the Latin nympha, which is the Latinized Greek word νύμφη, which roughly translates as "bride." The idea of the nymph comes out nature worship, in particular a reverence for the idea of fertility. Women, being the bearers of children, were seen as human representations of the ability for life to grow and flourish in nature. Coupled with the belief that nature was inhabited by personified spirits, the ideas eventually merged into the belief in female spirits that protected and actually helped nourish nature and life. Each nymph adopted a site where she lived. They chose trees, rivers, lakes, mountains, and so forth, each taking care of their dwelling place. The ancient Greeks worshiped the nymphs in several different ways. 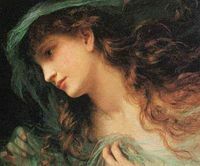 Often times those paying tribute to the Goddess Artemis, would also pay tribute to the nymphs in the same ceremony, since Artemis was seen as the mistress of the nymphs. The nymphs also had their own place of worship, the fountain nymphaeum, where the ancients could worship the nature spirits directly. A living legend of eternal beauty and grace, they are the image of the ideal woman in the fiery imagination of mortals. Much like the cyclical aspect of nature, nymphs were not immortal; they lived extremely long lives, but were prone to the processes of aging and death. Beautiful and fun personages, the nymphs could be childlike in their playful, cheerful, generous behavior. However, they could also feel anger, jealousy, and great sadness; even dying of a broken heart. As time went on, the nymphs evolved into several different categories, based on the type of environment they inhabited, which is how they are generally depicted today. There are three main classifications for nymphs: land, water, and tree. There are numerous sub-divisions within each category, depending on which type of environment the nymph is said to inhabit. For instance, a valley nymph is said to be slightly different from a mountain nymph, yet both fall into the land category. The nymphs of the land included the Oreads of the mountains, who had no fear of heights, leaping over precipices and climbing the highest cliffs. There were also the Napaeae of the valleys as well as the secretive Corycides of the caves. The most famous of the land nymphs were the Hesperides, who tended a blissful garden in a far western corner of the world, located near the Atlas Mountains in Libya, or on a distant blessed island at the edge of the encircling Oceanus, the world-ocean. They are sometimes called the “Western Maidens,” the “Daughters of Evening,” or Erythrai, the "Sunset Goddesses," designations all apparently tied to their imagined location in the distant west. Hesperis is appropriately the personification of the evening (as Eos is of the dawn) and the Evening Star is Hesperus. In addition to their tending of the garden, they were said to have taken great pleasure in singing. 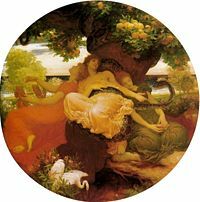 The garden of Hesperides was where the golden apples that Hercules was sent to obtain were located. Water nymphs presided over fountains, wells, springs, streams, and brooks, as river gods embodied rivers. Naiads were associated with fresh water, as the Oceanids were with saltwater and the Nereids specifically with the Mediterranean. They were often the object of archaic local cults, worshiped as essential to fertility and human life. Boys and girls at coming-of-age dedicated their childish locks to the local naiad of the spring. In places like Lerna, their waters' ritual cleansings were credited with magical medical properties. Animals were ritually drowned there. Oracles might be sighted by ancient springs. Tree nymphs, the Dryads or Hamadryads, were often associated with particular trees; the nymphs of oak trees were called Meliades while those of ash trees were Meliae. These nymphs were often believed to inhabit a particular tree, instead of a whole forest of wooded area and were often thought to be so integrated into their host that if the tree were to be damaged or killed, so too would the nymph. They came to represent the sacred quality of trees and the belief that trees should be revered and treated with respect. There is probably no nook or hamlet in all Greece where the womenfolk at least do not scrupulously take precautions against the thefts and malice of the nereids, while many a man may still be found to recount in all good faith stories of their beauty, passion and caprice. Nor is it a matter of faith only; more than once I have been in villages where certain nereids were known by sight to several persons (so at least they averred); and there was a wonderful agreement among the witnesses in the description of their appearance and dress. Usually female, they were dressed in white, decked with garlands of flowers, but they frequently had unnatural legs, like those of a goat, donkey, or cow. They were so beautiful that the highest compliment was to compare some feature of a woman (eyes, hair, and so forth) with that of nereid. They could move swiftly and invisibly, ride through the air and slip through small holes. Although not immortal, their lifespan was ten times that of humans, and they retained their beauty until death. They tended to frequent areas distant from man, but could be encountered by lone travelers outside the village, where their music might be heard, and the traveler could spy on their dancing or bathing in a stream or pool, either during the noon heat or in the middle of the night. They might appear in a whirlwind. Such encounters could be dangerous, bringing dumbness, besotted infatuation, madness, or stroke to the unfortunate human. When parents believed their child to be nereid-struck, they would pray to Saint Artemidos, the Christian manifestation of Artemis. Stock stories about nereids include the girl who fell ill and died and was seen after death dancing with the ,ereids; the Nereid changeling; and the man who won a nereid as his wife by stealing a piece of her clothing. The latter would become an ideal wife until she recovered her clothing and returned to her own people. The Greek nymphs were spirits invariably bound to places, not unlike the Latin genius loci, and the difficulty of transferring their cult may be seen in the complicated myth that brought Arethusa to Sicily. In the works of the Greek-educated Latin poets, the nymphs gradually absorbed into their ranks the indigenous Italian divinities of springs and streams (Juturna, Egeria, Cavmentis, Fontus), while the Lymphae (originally Lumpae), Italian water-goddesses, owing to the accidental similarity of name, could be identified with the Greek Nymphae. The mythologies of classicizing Roman poets were unlikely to have affected the rites and cult of individual nymphs venerated by country people in the springs and clefts of Latium. Among the Roman literate class their sphere of influence was restricted, and they appear almost exclusively as divinities of the watery element. Tree spirits, similar to the Dryads, are common to many cultures, especially Celtic mythology. They particularly live in sacred trees such as willows, oak, ash, and thorn trees. Huldra or Skogsra is the Swedish wood nymph, usually described as a beautiful woman who takes care of the trees, dwelling deep in the forest. Japanese mythology also features tree spirits who dwell within a particular tree and function as its caretaker. Unlike other similar creatures, few nymphs have been depicted on film, in television, or in other forms of mass media and popular culture. They appear in the Chronicles of Narnia by C.S. Lewis and also sometimes appear in role-playing fantasy games, such as Dungeons and Dragons. ↑ Oxford English Dictionary (Oxford University Press, 1971, ISBN 019861117X). ↑ Micha F. Lindemans, "Nymphs," Encyclopedia Mythica. Retrieved September 19, 2007. ↑ Herbert Jennings Rose, A Handbook of Greek Mythology (New York, NY: E.P. Dutton & Co., 1959, ISBN 0525470417). ↑ Pierre Dubois, Claudine Sabatier, and Roland Sabatier, The Great Encyclopedia Of Faeries (New York: Simon and Schuster, 2000, ISBN 0684869578). ↑ John Cuthbert Lawson, Modern Greek Folklore and Ancient Greek Religion (Cambridge: Cambridge University Press, 1910, ISBN 0766176444). ↑ John L. Tomkinson, Haunted Greece: Nymphs, Vampires and Other Exotika (Athens: Anagnosis, 2004, ISBN 9608808707). ↑ Cassandra Eason, A Complete Guide to Faeries & Magical Beings: Explore the Mystical Realm of the Little People (Boston, MA: Red Wheel/Weiser, 2002, ISBN 1578632676). Lawson, John Cuthbert. 1910. Modern Greek Folklore and Ancient Greek Religion. Cambridge: Cambridge University Press. This page was last modified on 15 December 2018, at 16:49.